Easily Review 2019: Is Easily a Good Hosting? Easily is easily one of the first web hosting providers around, making them one of the most experienced and consistent. Customers can use their add-on tools to help create their website or launch an online store. 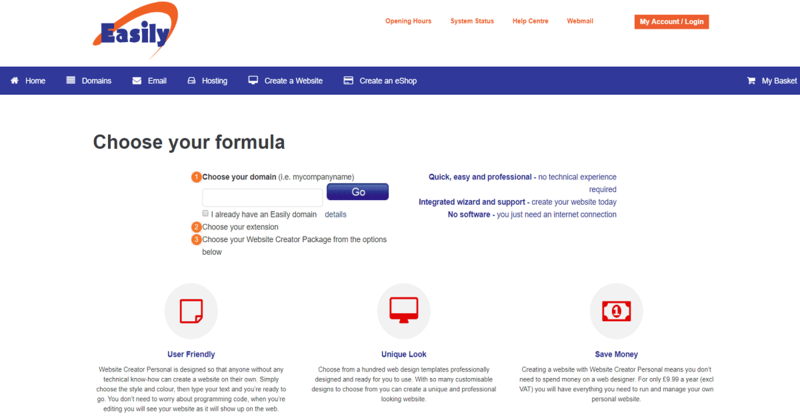 Easily is a U.K.-based hosting provider that started life as a domain registrar, Easywebnames.com, back in 1999. Easily itself was later launched with the primary purpose of providing affordable and simple hosting solutions, though they still provide domain name registration services and see themselves as one of the pioneers that made domains low-cost. Today, they serve customers all over the world but are still focused on the U.K. market. Except for a hiccup when they switched portals, it’s pretty straightforward to use the Easily management tools. However, the graphics are a bit dated by now and it’s due for an overhaul. If you choose to use WordPress with the one-click installation feature on your hosting solution, you won’t really need the control panel much. The same can be said of their other tools, such as the e-shop, website creator, and webmail tools. Luckily, it’s quite easy to choose a pricing plan on Easily. They’ve kept it deliberately simple with hosting broadly split into either Linux or WordPress hosting with three plans each. All plans are billed yearly. Both beginner plans are ideal for small websites or blogs, advanced plans are geared more towards small businesses who need a bit more resources, and professional hosting is for larger businesses with high computing demands. All plans come with unlimited bandwidth, one-click WordPress installations, and a hosting manager control panel. There aren’t any free plans, but there is a 30-day money back guarantee. There are also paid subscriptions to their website creator tool, webmail, or online shop tools. If you need any of these, remember to calculate it into your total costs. Easily provides phone support in the U.K., but only within office hours during the week and for a few hours on Saturdays. Staff are overall friendly and helpful. However, it seems as if they suffer from a lack of resources as they can be slow to reply, especially when something happens that affects a large group of customers at once. For example, their shift to a new portal a few years back left many unable to access their websites for some time. Easily does actually make it simple to get your hosting solution up and running, particularly if you want to use WordPress to manage your website. Their affordable plans and straightforward solutions will be appealing to small businesses or individual website administrators. Wondering how Easily stacks up against other Web Hosting companies? Enter any other Web Hosting company and we will give you a side-by-side comparison.